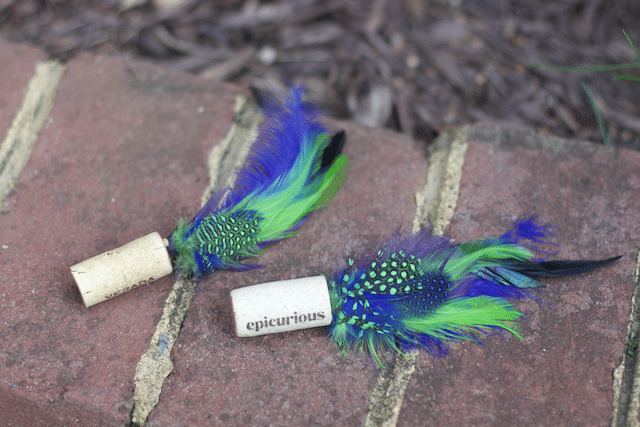 This DIY Inexpensive Feather Cork Cat Toys post is a sponsored conversation written by me on behalf of The J.M. Smucker Company. The opinions and text are all mine. Our pets are truly a part of our family. It is so important to give them the nutrients necessary to live a long and healthy life. This means giving them food that not only tastes great but is high quality and made with wholesome ingredients. 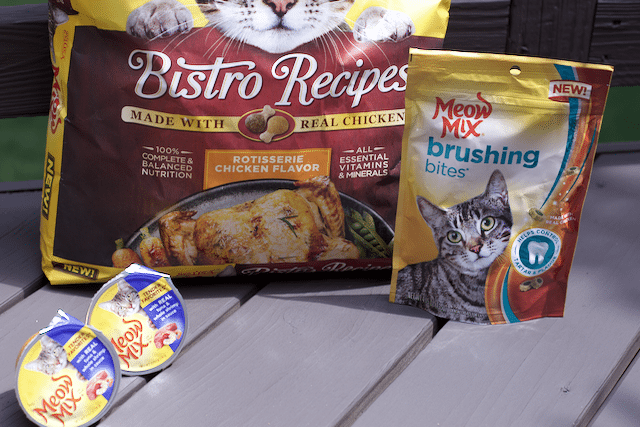 Meow Mix products offer a great selection of different cat food textures and flavors to please any finicky cat. Meow Mix is a trusted brand that strengthens the bond between you and your cat. Lacey is a not fussy eater and we like to give her a treat every once in awhile. Today we are giving her a wet food, a serving of Meow Mix Tuna & Shrimp Lovers that we purchased from Walmart. You can tell just how much she is enjoying her special treat. There is no doubt she is enjoying this soft food. Like people, she gets bored of the small kibble, so a little wet food is just what she wants. Shrimp and tuna, quite a gourmet snack. Lacey is a laid back cat and we can find her laying around the deck on most days. Sometimes she will come scratching at the glass doors asking to be let in. 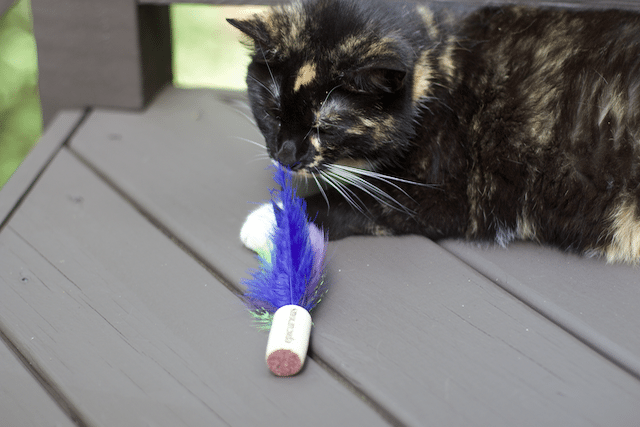 To reward her we decided to make her some fun DIY Inexpensive Feather Cork Cat Toys. 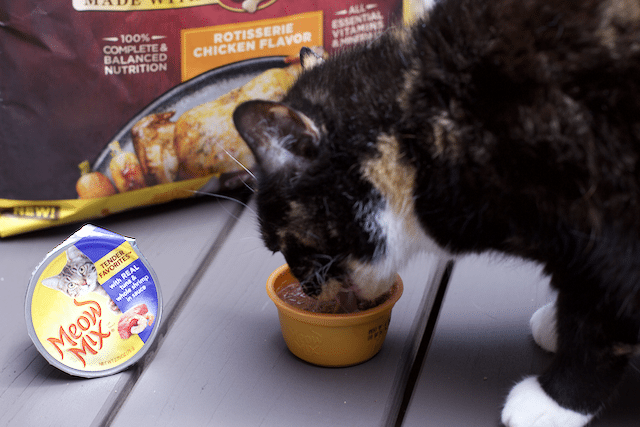 Brushing Bites – Made with Chicken – Check out our Cat Treat Container Tutorial. 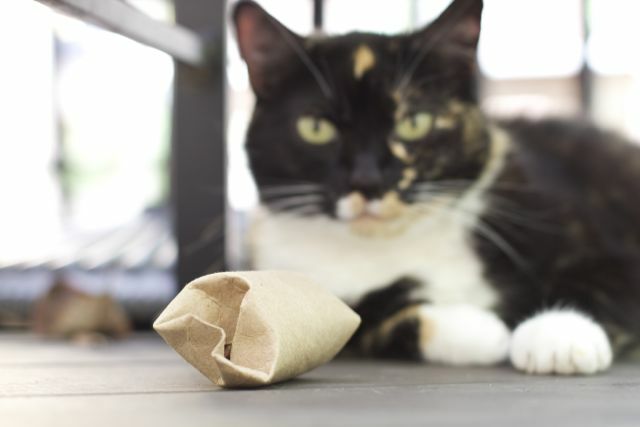 This DIY cat toy could not be any easier and will take only minutes to make. 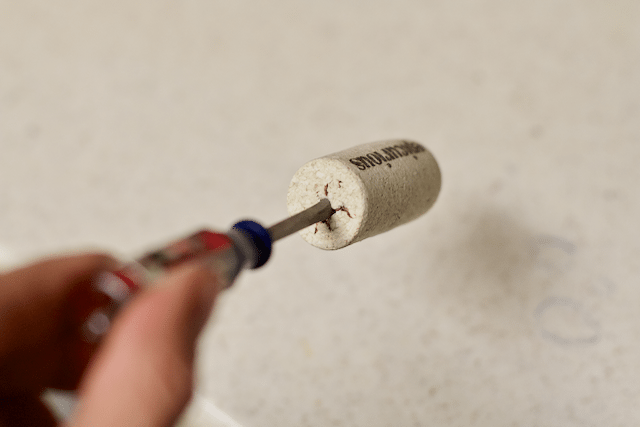 Simply drill a hole into your cork using a screwdriver. Be sure it is deep enough to fit the stems of the feathers. 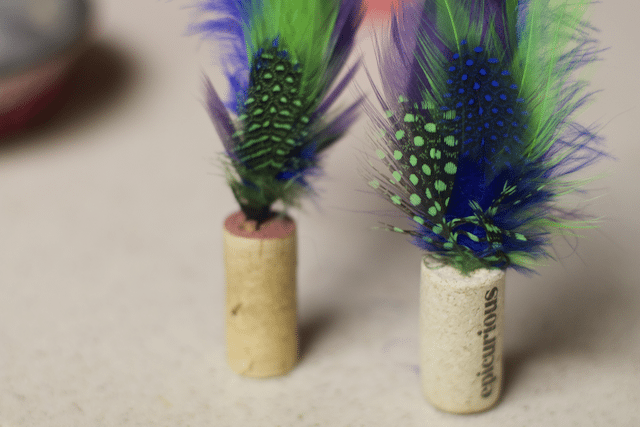 Using some hot glue secure the feathers into the cork. 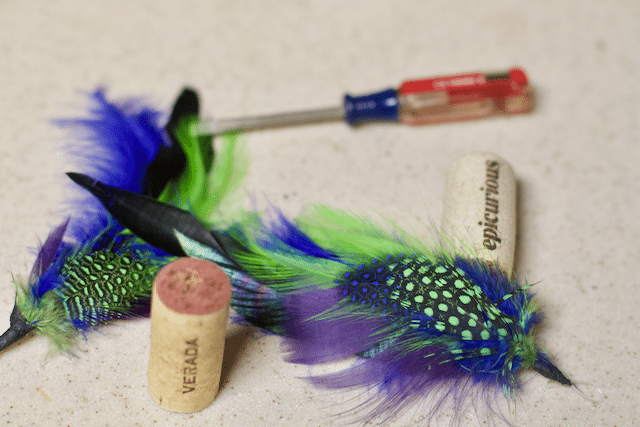 Just like that you have DIY Inexpensive Feather Cork Cat Toys for your curious and playful felines. They may not look like much but these are inexpensive and are sure to gain the attention of even the laziest of cats. No offense sweet Lacey, but you would rather lay around than play. 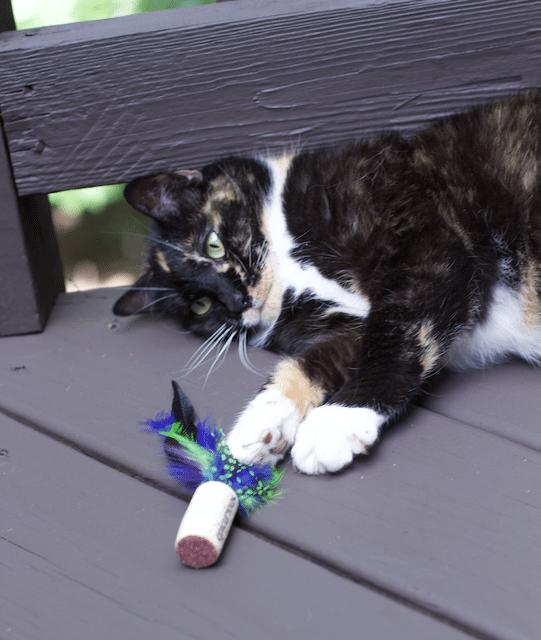 Looks like these cork cat toys might have caught her attention. 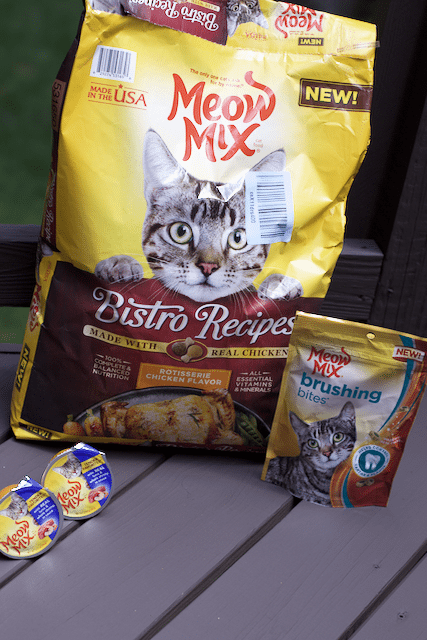 Save money on Meow Mix Cat food at Walmart. You can find these products at your local Walmart, be sure to check out Walmart.com too. This Cat Puzzle is filled with Dry Meow Mix to help entertain our cat. 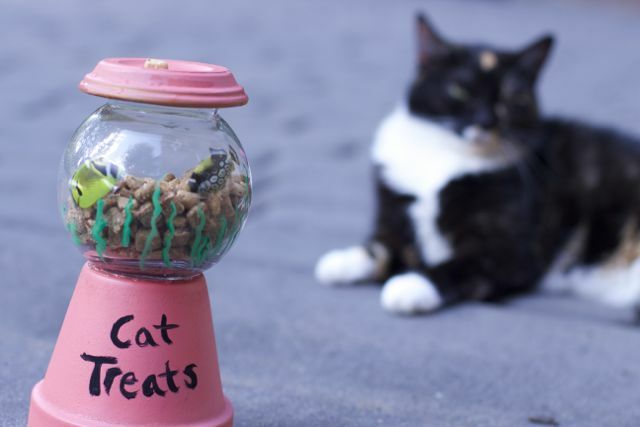 This DIY cat treat holder is filled with Brushing Bites. A great way to help maintain your cat’s dental health. So no matter what personality your feline represents; cuddles, mischievous, or independent, they deserve a food they love just as much in return. 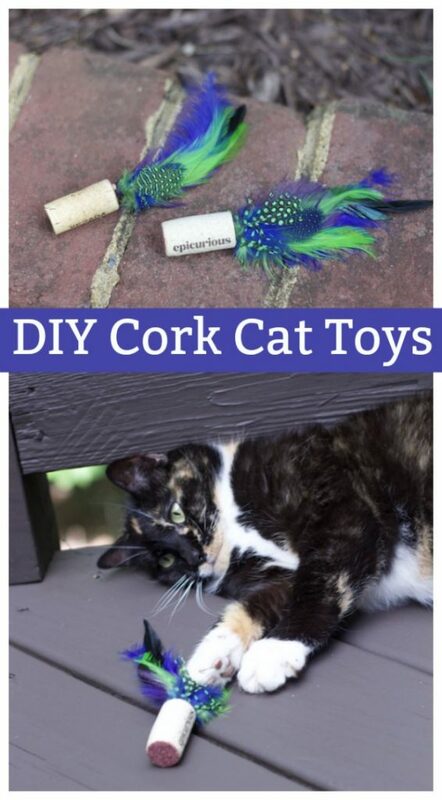 Pin this for next time you have a bottle of wine and want to make a cork cat toy!! The cork cat toys are such a cute idea! I will try to make some for my cat. She’s going to love it and probably, it will give me a few hours of rest! I will have to try Meow Mix too! We don’t have any cats but these are really cut and cheap ideas to entertain your cats. I love how simple and easy they are to make. This is the perfect project. Im getting tired of spending so much money on cat toys for my kitty to destroy it. What a cute cat toy! My cats would love to have these to play with! I have two cats in my home (and three dogs). My youngest cat would love to take a stab at destroying one these DIY toys. What a fun idea! I know cats love feathers. THis seems like it would be so simple to make! She is pretty lazy, but if you cat is excited about treats than a few mintues. No pets in our home now that the kids are grown and we like to travel more. The cork toy is such a sweet idea, and I love the cat puzzle too. How long does it take for your cat to get to the treats inside? This is such a cute idea! We have 3 cats who would love these.